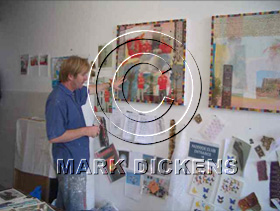 Mark Dickens is a British artist whose work has shot to acclaim in the United Arab Emirates and Europe. He has recently finished a ten painting commission for Abu Dhabi Motor Sport Management. His work can be found in the Royal collections of H.H Sheikh Hamdan Bin Zayed Al Nahyan and also private-public collections around the world. "I've always felt the need to constantly expand my vocabulary of images and techniques, not to be bound by the constraints of conventional methods, improvisational rather than formulaic. 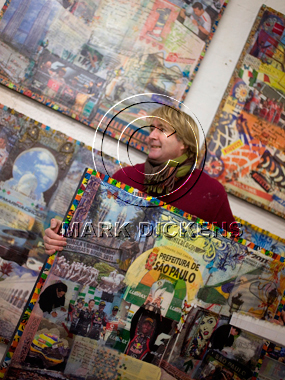 I like to think of my work as a liberating visual experience for both myself and the viewer." "My normal practice involves collaborations with people and places and takes the visual format of mixed media collage including the use of print, fabric, gold leaf, paint and handwritten texts set into resin on books or board." and Masaccio's frescoes in the Brancacci Chapel in Florence."